Our celebration of the death of Our Holy Father Saint Francis was beautiful, and we thank all of you who came to share it with us. Since it was on a Friday this year and adoration was taking place in the Sacred Heart Chapel, the Transitus was held in the main church at the high altar. As always, Fr. Phillips delivered a very beautiful sermon on our saint, and we were so excited to share it with you. Unfortunately, due to technical difficulties (or to a technologically deficient nun operating the recorder) we don’t have the audio file. Perhaps it was fitting that, in celebrating a man who is the icon of evangelical poverty, we couldn’t hoard even the beautiful words that were spoken about him. Here are a few snippets of thought we can cobble together from Father’s sermon, based on our notes. It is remarkable how closely conformed Francis is, in almost every detail, to Christ. He was living a life that at first sight seemed so unattractive, but over time followers came, first by the dozens, then by the hundreds, then by the thousands, to follow Francis, who was following Christ. 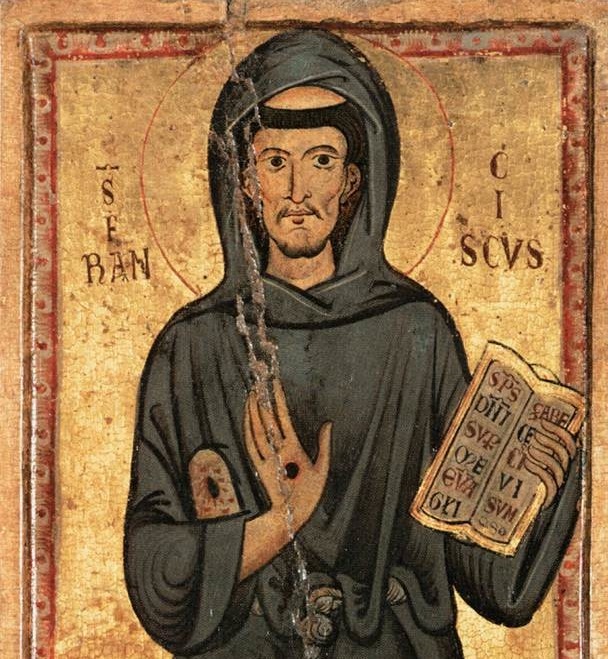 Francis was an icon of Christ. An icon is more than an image, the word in Greek means a present reality. When looking at an icon, we are in the presence of that saint, not looking at an image. Christ was so present in Francis that to be in his presence was as though one were in the presence of Christ. We are each called to relate to holy things in varied ways, and there are parts of Francis’ life that everyone can grab hold of [regardless of our state in life]. God achieved in the life, in the body, and in the soul of St. Francis such an icon of Christ that there is something there for each one of us. Francis the icon. Francis, the reality of God in our midst. Father closed with an exhortation to pray for the dying. In retrospect, we see how inspired these words were, as we learned the next day that Fr. Benedict Groeschel had passed away late Friday night. Life finds in death a door to life eternal. In celebrating the death of St. Francis let us pray for those who know they are going to die this night, and those who have no idea they are going to be taken. This entry was posted in A Nun's Life, Saints & Angels and tagged Fr. Christopher Phillips, St. Francis, transitus by texasnuns. Bookmark the permalink. It was a privilege to be there; thank you for sharing this celebration. We’re so glad that you were able to be there! I heard from Fr Anthony’s announcement at EWTN’s Mass on Saturday, October 4th, that Fr Groeshell died early morning hours; on the Feast Day of St Francis of Assisi.